Capcom made a new, rare Nintendo NES game - more than 25 years after the Nintendo was made. A gold cartridge of Duck Tales. Capcom sent this to various media outlets to get some PR for the digital Duck Tales Remastered being released August 20th. 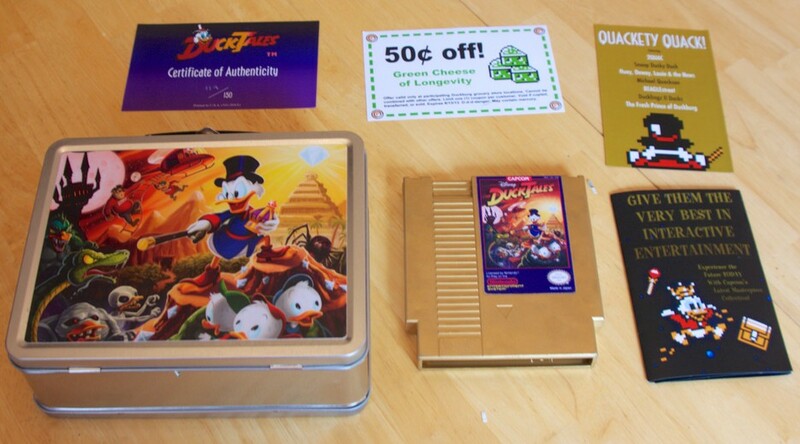 It includes a metal lunchbox, certificate of authenticity, marketing materials, and a gold Duck Tales cartridge. Unlike the Mega Man 9 press kit, which included a non-working Mega Man 9 NES game, this Duck Tales actually works. Capcom made 150 of these cartridges so it is definitely a rare game. None of these have shown up on eBay yet, but you can be sure one will soon. It should be worth a lot more than the original Duck Tales, which sells for $14. Will it be more be than Duck Tales 2 which sells for $105? The Mega Man 9 press kit sells for about $200-300, but that game doesn't work. Will this be worth more because it works? What do you think it will sell for when the first copy sells? This could be very interesting. People are already headhunting for it. Will Classical collectors accept it as an official variant? Does the cart contain anything which wont make it easy to bootleg? @anonymous - My guess is collectors will accept it as a variant because it is made by Capcom and it actually plays on the NES. We will have to wait and see though. @anonymous - I doubt the cartridge has anything special designed into the circuit board that makes it hard to bootleg. It is probably a standard NES circuit. The article says it is new circuitry, but I doubt they added bootleg safeguards for it. If people are in doubt of authenticity there will probably be a big price difference between the loose and complete versions because CIB ones would come with the authentication card and other items that would be harder to forge. As soon as I heard about this I knew it would be insanely valuable. Given this is an official NES cart, and is way more rare then even Action 52 or Bubble Bath Babes, I bet this thing complete sells for over $1000. They should have put this up on the capcom store instead of a PR stunt. Capcom approved a quasi licensed/unlicensed game made by reproduction companies. This is probably the most interesting NES cartridge to date. Congrats on Iam8bits and Sky Walker Games on being part of history. I just found out I won one of these press kits in their singing contest so I'd be very interested in finding out what it's worth.